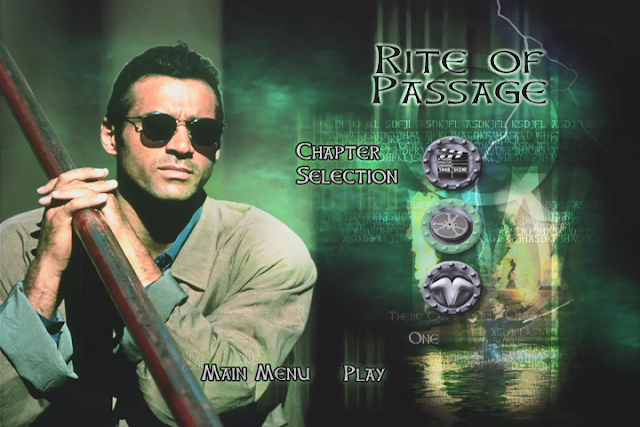 Since it's been a while, here are the previous posts for this game. It's been almost two months since the last post, and it's time for the second half of Let's Go Pikachu. First up, I find a developer room with some weirdoes in it. I think our hero should get going, like, muy pronto. Vamos! 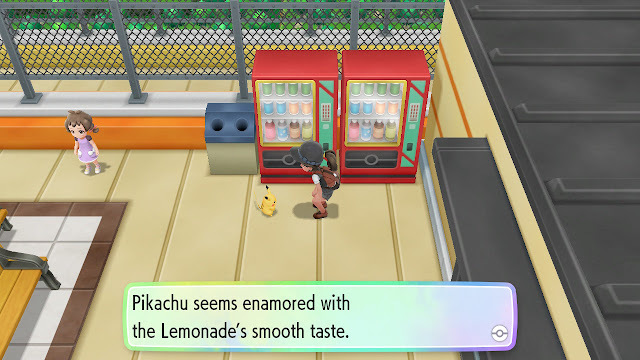 What in the blue hell is this immersion-breaking? 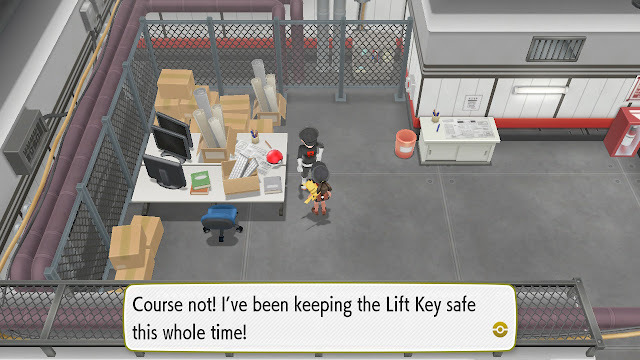 There's a reason programmer's rooms are usually relegated to the depths of secret endings and hidden castle basements in other RPGs. Anyway, we left off with me having to go to Pokémon Tower, a dreaded, accursed place known to the locals as "Torre De Los Muertos". 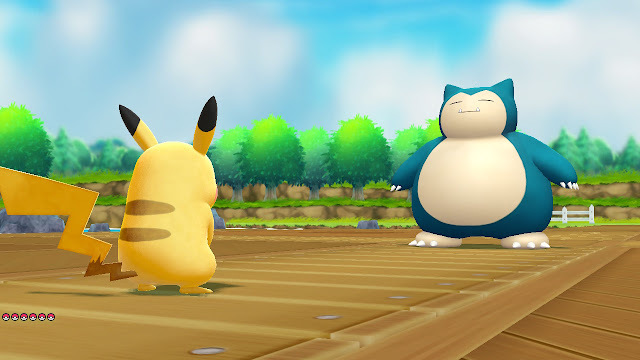 I'm welcomed back with a fight against the worst rival in Pokémon game history. Seriously. 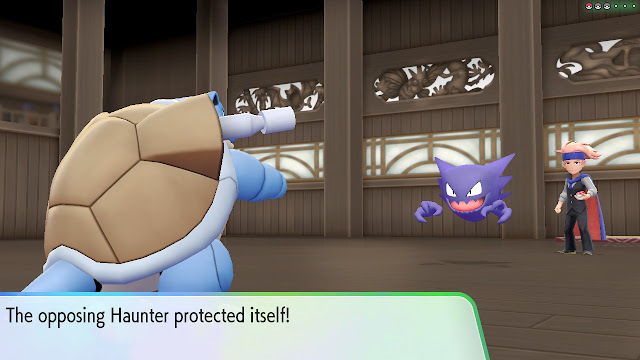 While other Pokémon rivals have a variety of competitive edges to them and generally possess a steadfast determination to beat our hero, this guy's only goals are to A) Be Safe and B) Have Fun. 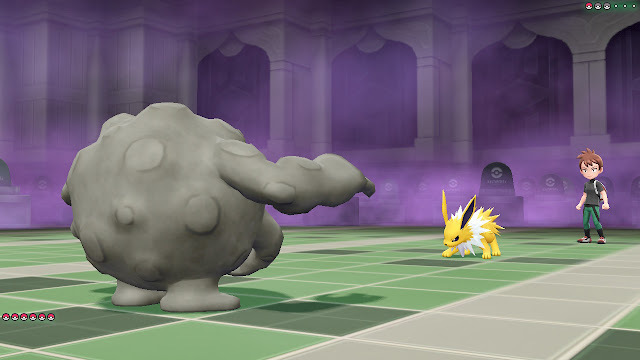 I send out Graveler to trounce his Jolteon with ease. 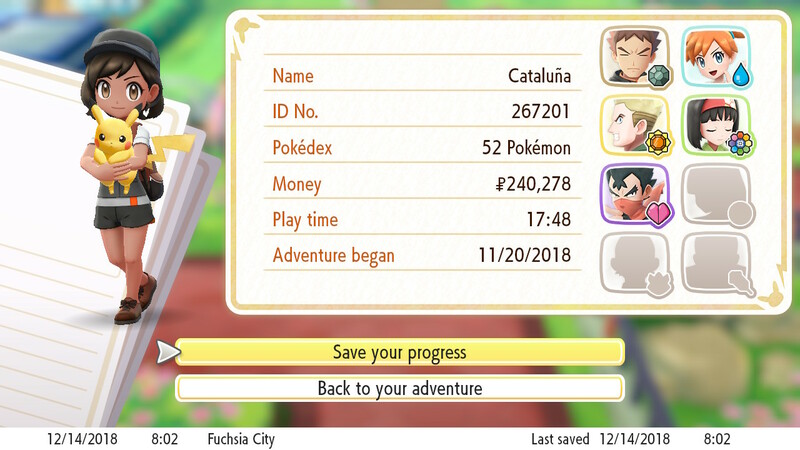 After another retreat, I found myself lost for a good hour or so of gameplay. 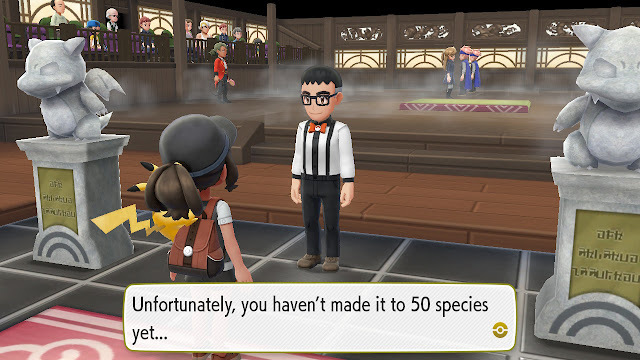 Unfortunately I was on a plane over the Atlantic, so checking a guide wasn't a possibility, and somehow the 3x times I played Generation 1 in the past weren't enough for me to remember what to do. 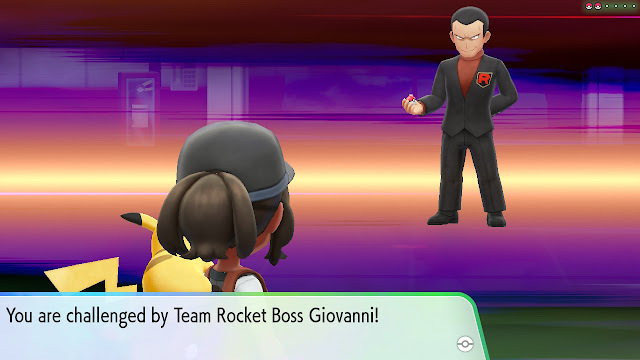 I ran back and forth between the various towns and routes for that hour until I finally found this one Team Rocket guy in the arcade. Whew. At least being lost meant I defeated pretty much -every- trainer available in the overworld at this point. 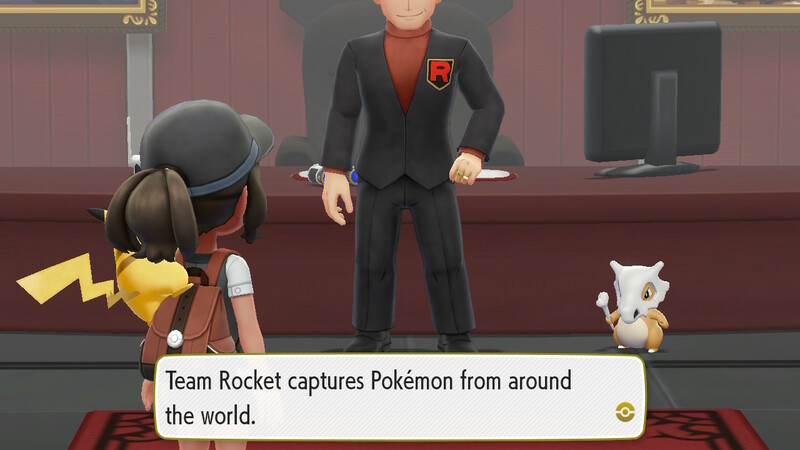 Next up is a Team Rocket base. The game slows down quite a bit at this point, ceasing to be a sprint from gym to gym as we take on the Rockets in their various dungeons. ...the cigarette company lobbyist (who isn't looking so good) and the snake from the Garden of Eden, who now sports an Imitation Face. It has always been interesting to me how different creatures, like cobras and butterflies, make themselves look like they have the face of something much larger in order to ward off challengers. Continuing on...meh, there's just no end to these Team Rocket jobbers. Is that Cubone back there? HAND IT OVER. Archer summons Golbat to unhinge his jaw and attempt to swallow Arcanine whole. 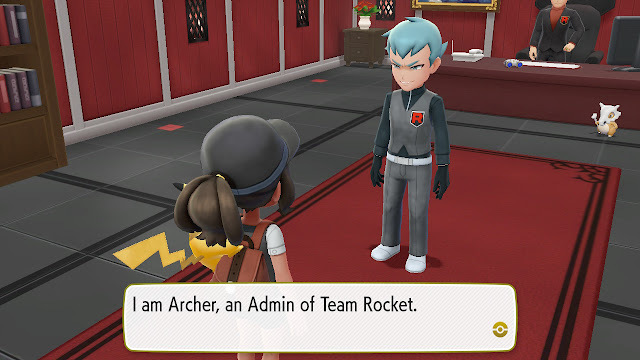 With Captain Archer out of the way, the Team Rocket boss is going to have to deal with us himself. This guy is as close as the Gen 1 world has to a full-on supervillain, and he's nothing to take lightly. It's CAT FEVER as Giovanni brings out his signature Pokémon. ...and hands me a super-rare loss. 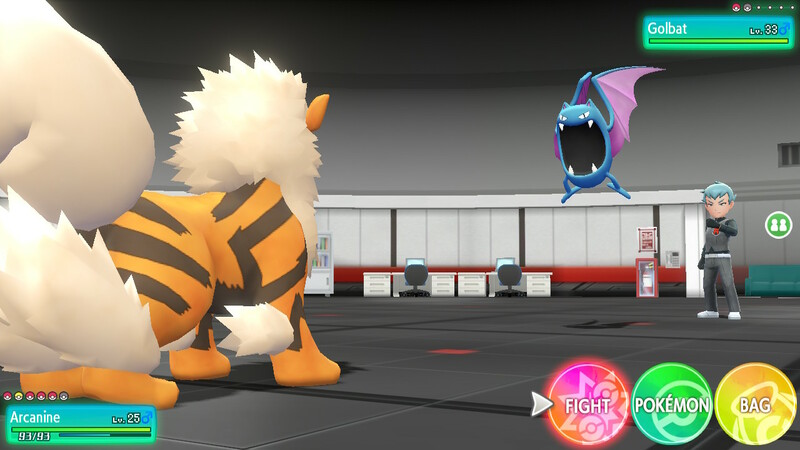 While he may only have two Pokémon, they're both significantly beefed. 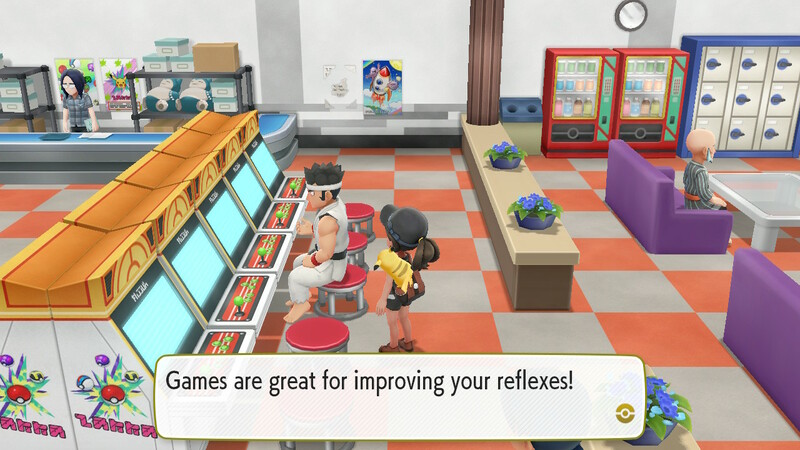 Back out in the arcade, our hero encounters a Ryu cosplayer. 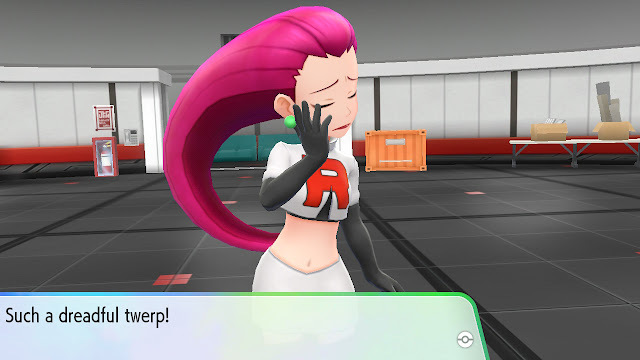 After resting up, it's back to the Team Rocket base. Luckily I don't have to go through Jessie, James, and Archer again. 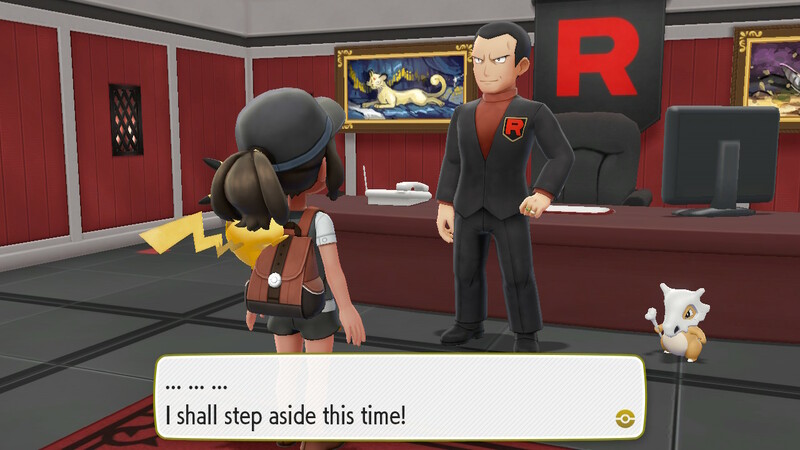 His Persian is just the Nappa of the pair, and the Rhyhorn he follows it with is MURDER. Still, I eke out a win. 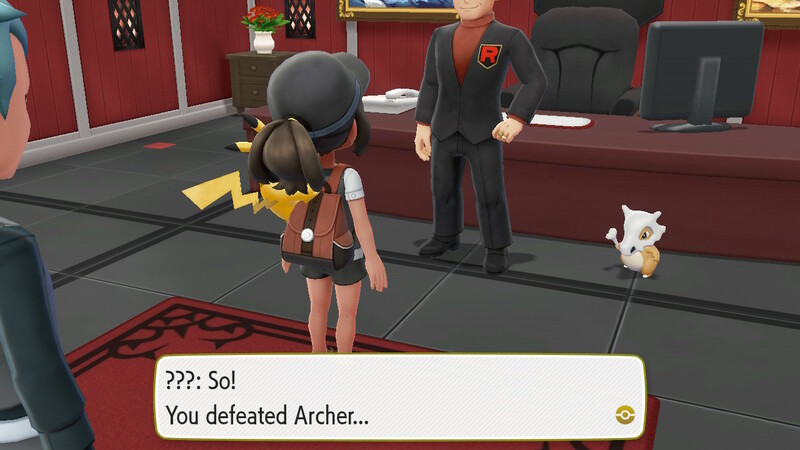 That was a difficulty spike, to say the least. 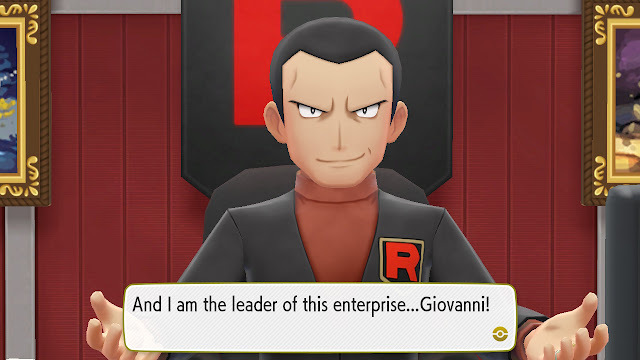 Dwarfed any of the gym leaders in this run. Winning gets me Cubone, who he was holding hostage for some reason. 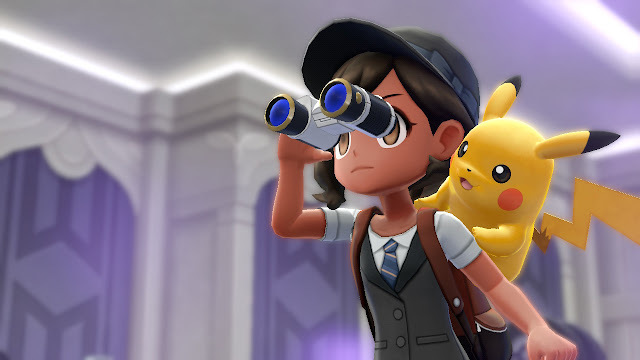 It also gets me the Silph Scope, which means it's time to head back to the Pokémon Tower. 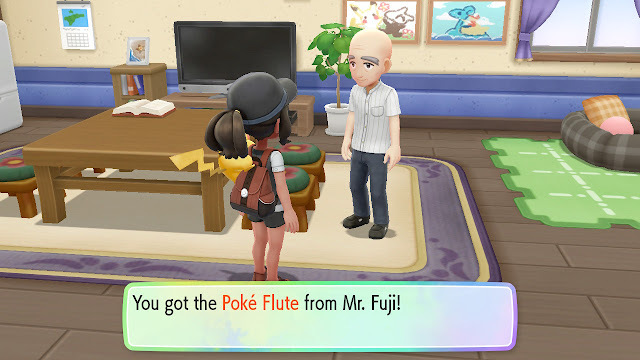 Believe I mentioned it before, but I can't read "Mr. Fuji" without thinking of Jesse Ventura on commentary talking about "MISTER FOOGIE" back in early 90's WWF. 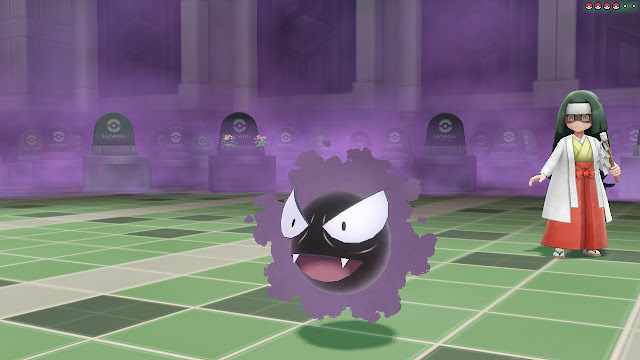 Now that I have the Silph Scope from Rocket HQ, I can see the ghosts in Torre De Los Muertos. A rare healing spring is found here. 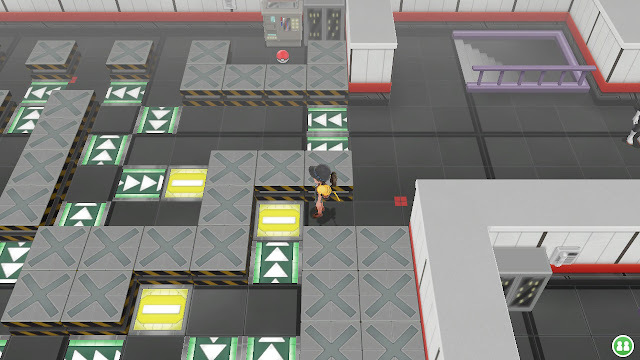 In versions of Gen 1 that have random encounters, this is a good mid-game spot to stop and grind out some levels. I usually make it a point to do that when I find healing springs in RPGs. 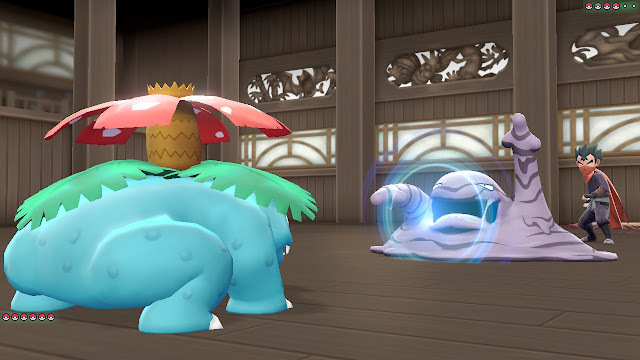 The tower is crawling with these creepy spirit-channeler trainers, and they tend to sic lots of Gastlies on you. 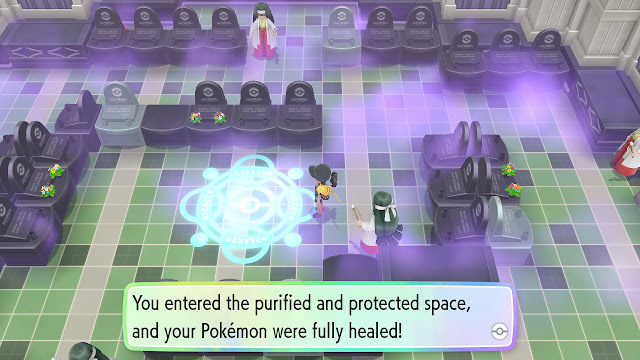 The healing spring makes it easier to deal with all of these guys, at least. 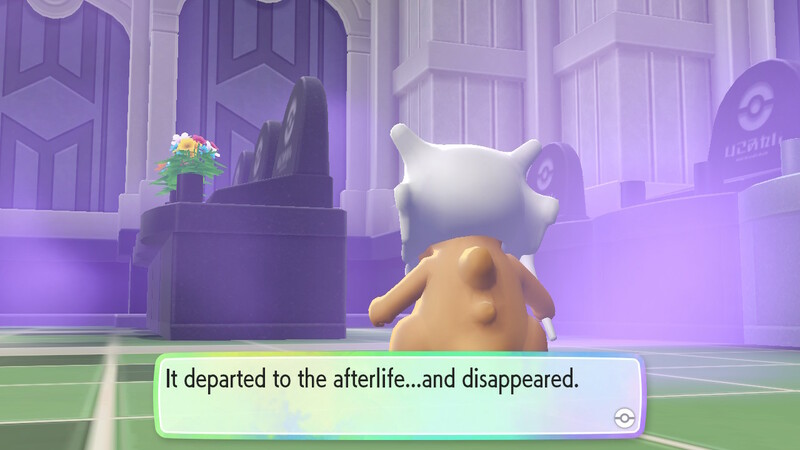 Egad! 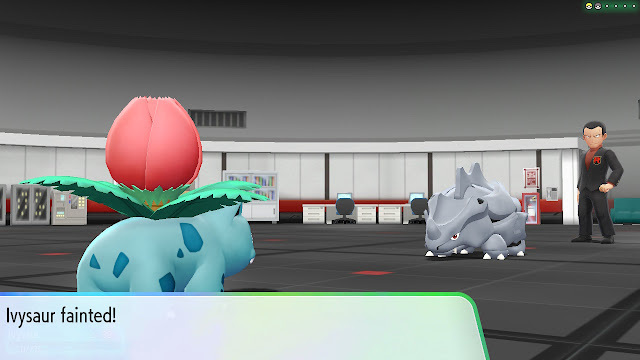 While it feels like I just got Ivysaur, he's already evolving into his third form. 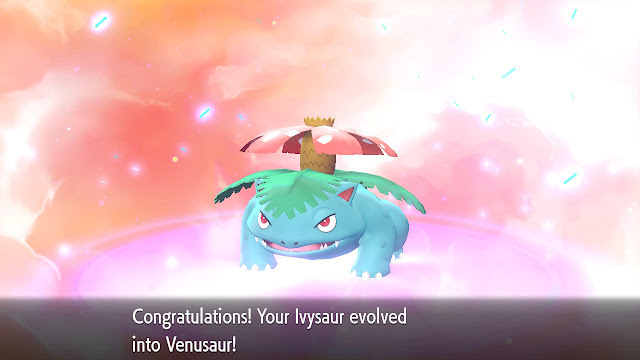 Venusaur is a BEAST with the hitpoints, and once he gets Petal Dance he can one-shot a lot of foes. 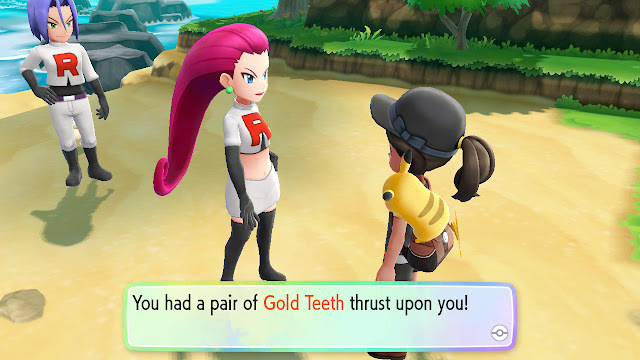 ::Will Smith voiceover:: "Damn, that's hot!" Marowak is the ghost of Cubone's mom, in what has to be the saddest part of Pokémon Gen 1. 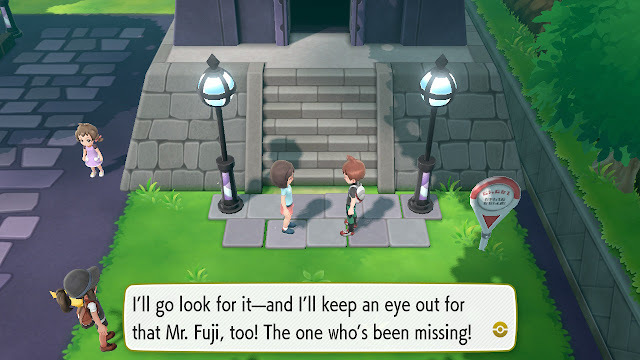 Because it isn't much of a reunion...she poofs, and the poor guy is left behind. 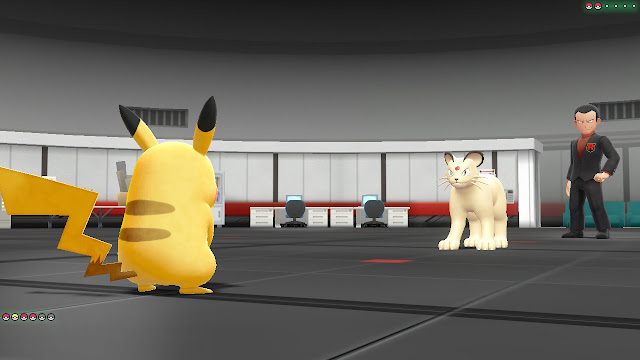 Generalisimo adopts Cubone, however, in the first likeable thing he's done. Upstairs we find ::Jesse Ventura voice:: MISTER FOOGIE, and he's not alone. Luckily, Team Rocket beats a hasty retreat this time. Mister Fuji parts with a very important item. Without this, you can't even get to the southern half of the world. With the Poké-Flute now acquired, I can wake up the various Snorlaxes that guard different routes. These things are damage-sponges, and are basically a DPS check on your party. 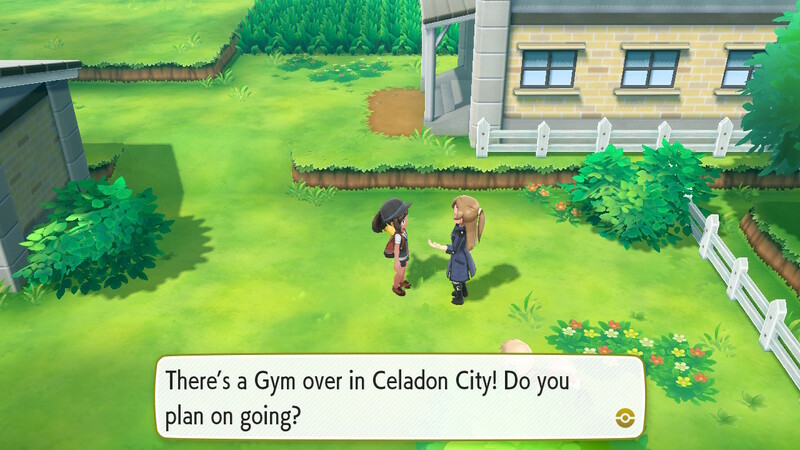 I cleared out most of the nearby routes earlier when I was stuck, so it's a fairly quick jaunt to the next town. Turned out I missed a couple of fights, though. 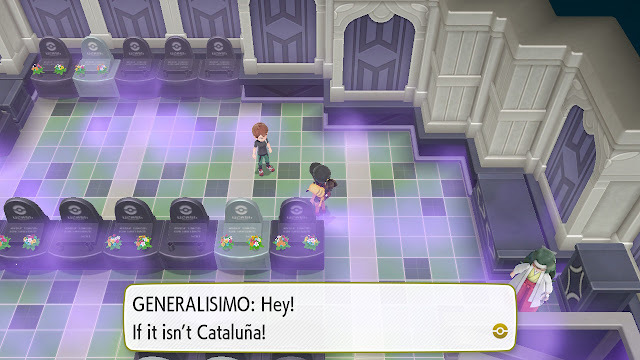 Sorry, lady, Cataluña only has eyes for one: Pikachu. This is the most depressing thing since the Cubone affair: A guy who was stood up for a date. Today on the most depressing episode of Pokémon! 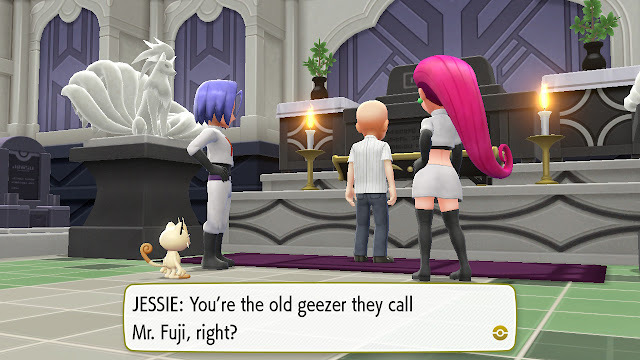 Next up: A reminder that we all get old! 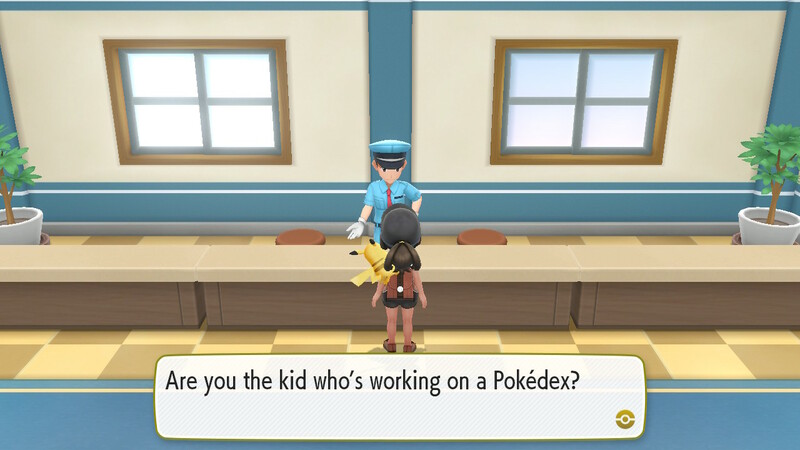 I'm pretty sure lots and lots (and lots) of kids are working on a Pokédex. 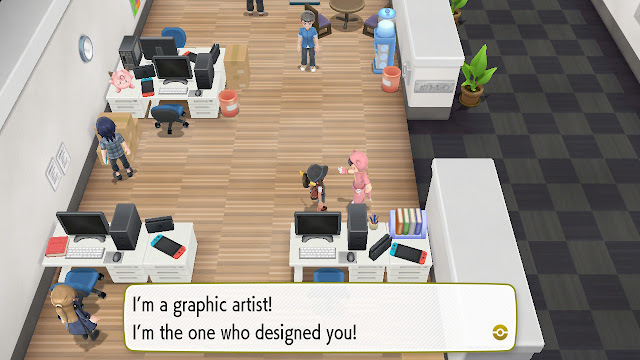 It's like when I was a kid and would call into the Nintendo Game Counselors and mention that I wanted to be one of them, then I'd call back later and be like "It's me, the kid who wants to be a Game Counselor"
Whoa! This is one of my favorite Pokémon in this gen. 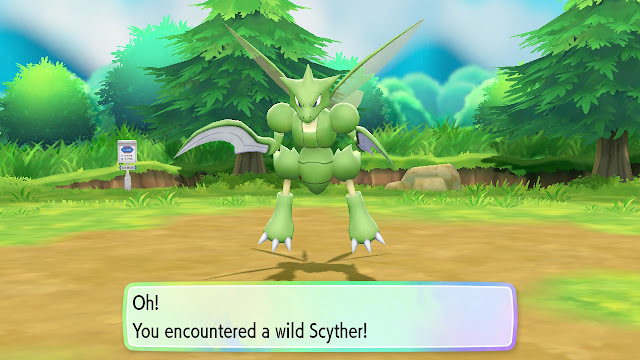 Unfortunately it got away after about 18 ball-escapes, and I didn't get a second one to appear. The catching mechanic in this game has really gotten old. Arriving at the next town, Jim's Dad welcomes us to the 5th Gym. However, his latest arbitrary "you must be this tall to enter" challenge is the first one I don't automatically meet, so my momentum is halted. They already made Low Level Games a thing of the past with this guy, now they've made speedruns a thing of the past too. 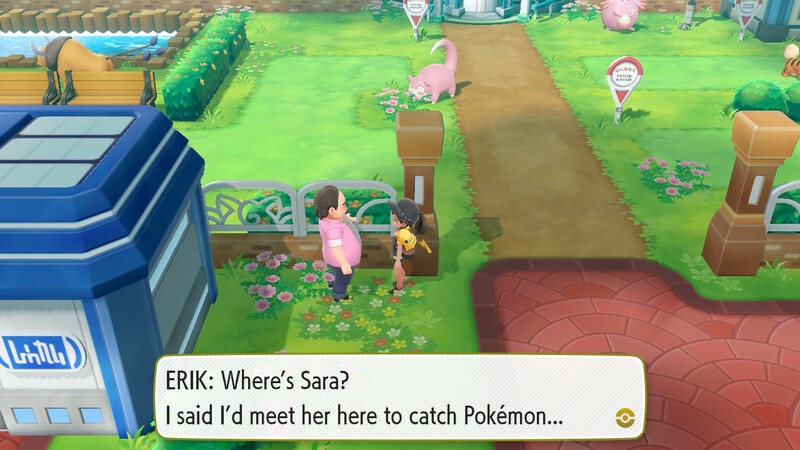 This is a good excuse to go out and look for things I haven't caught yet, at least. 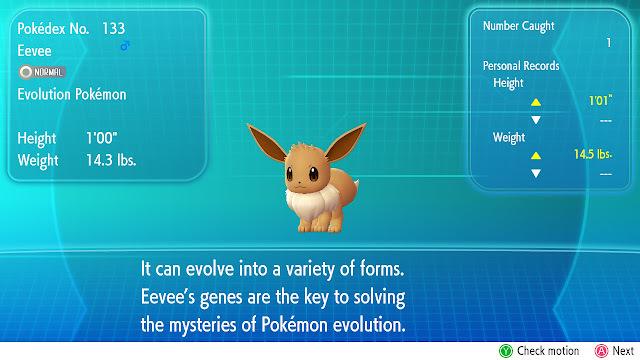 Eevee is a very welcome addition to the team, though I'm not sure if I've got room for it yet at the moment. 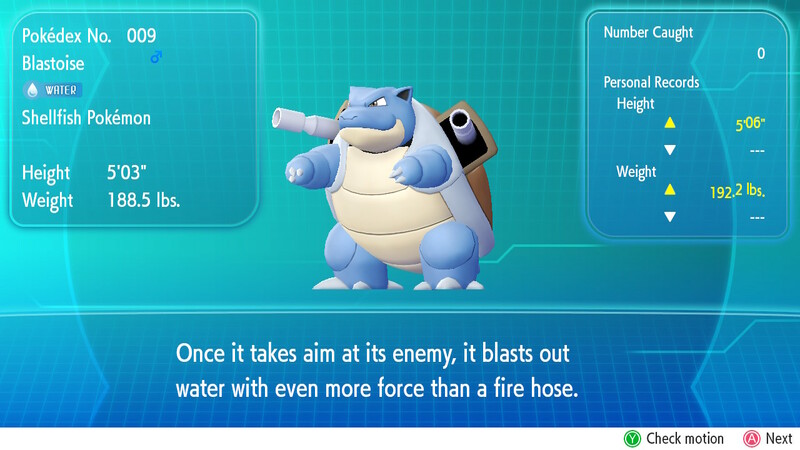 I get my second starter tier 3, as Wartortle evolves. 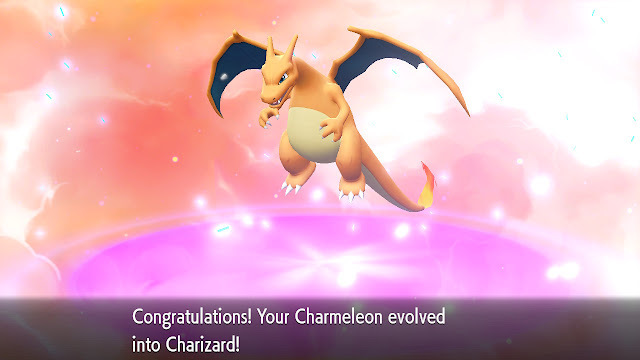 Charizard can't be far now, and he's the best starter tier 3. That's Erika's gym! 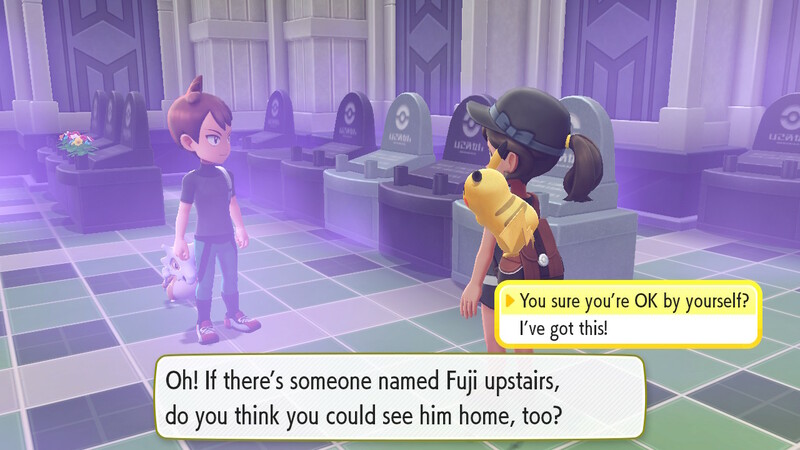 Little does this woman know, I already burned it down. 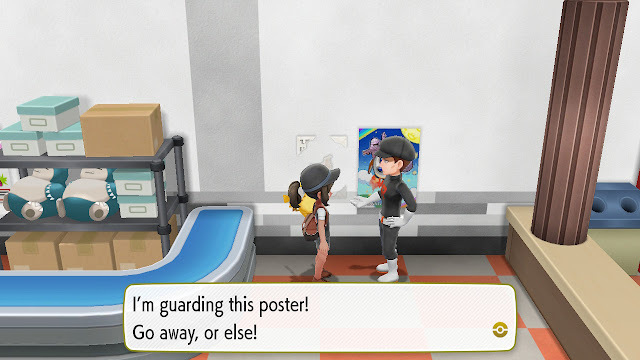 Speaking of which, there's Charizard. Imagine how easily one could roll over Erika's gym with this form. 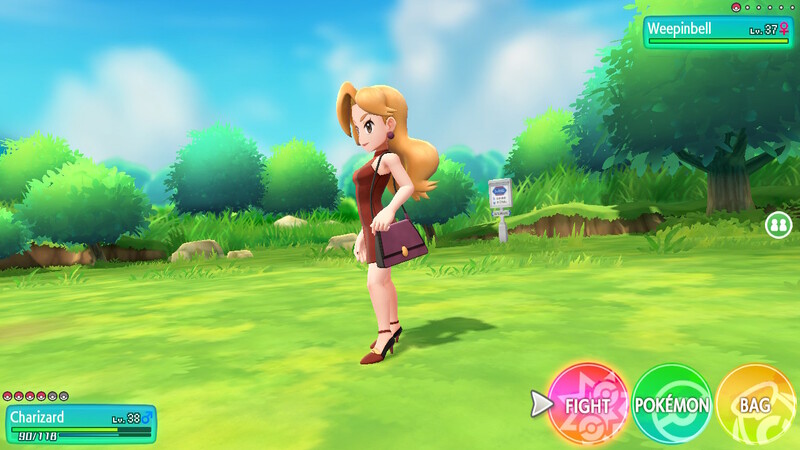 This trainer looks like one of my exes, joining Misty in that group. 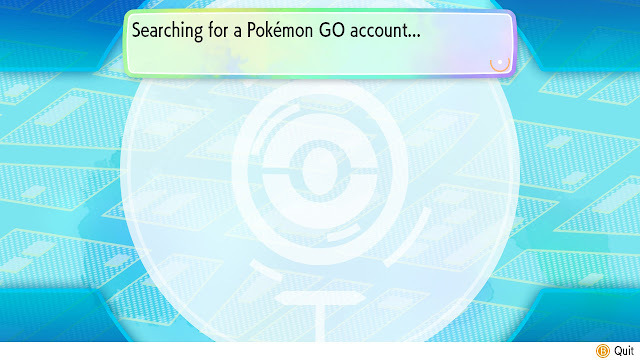 Eventually I give up on getting to 50 Pokémon out in the wild, linking up to my old Pokémon Go account that I haven't played in two years. 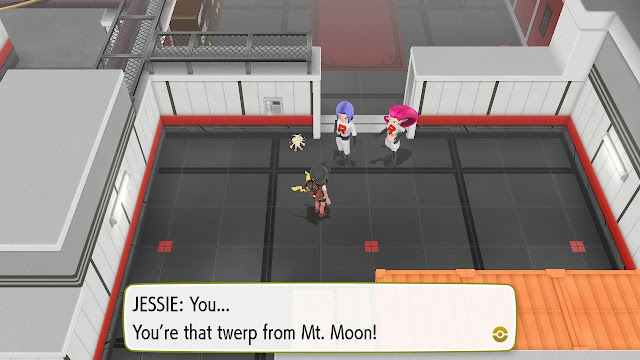 Turns out you can port 'Mons over from there, though it's a bit of a hassle and I did it wrong the first couple times (losing a few 'Mons in the process as they got candied by the diabolical Professor Oak). 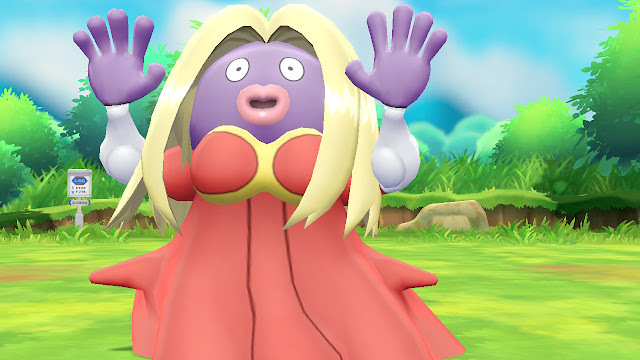 This nets me a number of new 'Mons, like the racist monstrosity known as Jynx. How is Jynx still a thing? 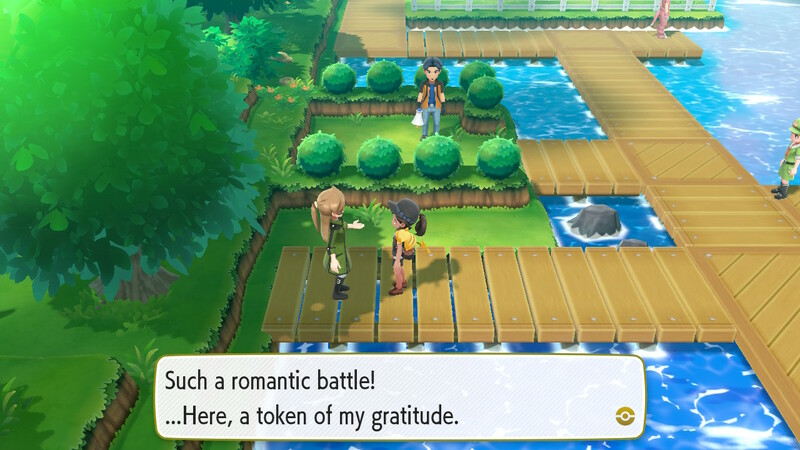 ::sigh:: Just let me by, dude. 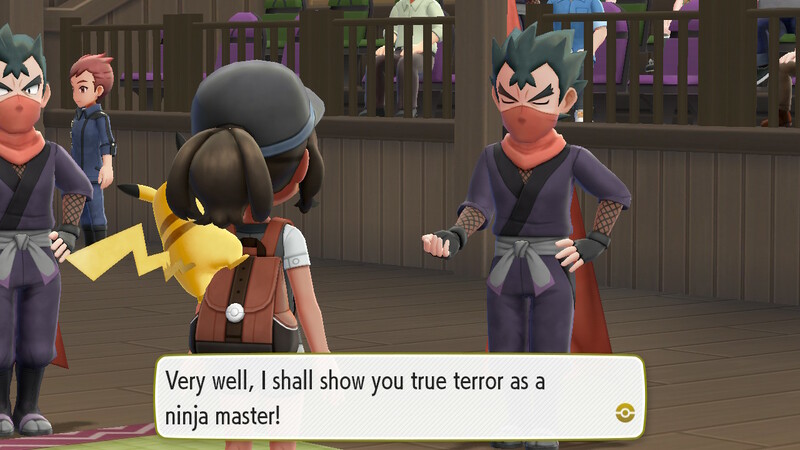 The boss here is Koga, ninja extraordinaire. 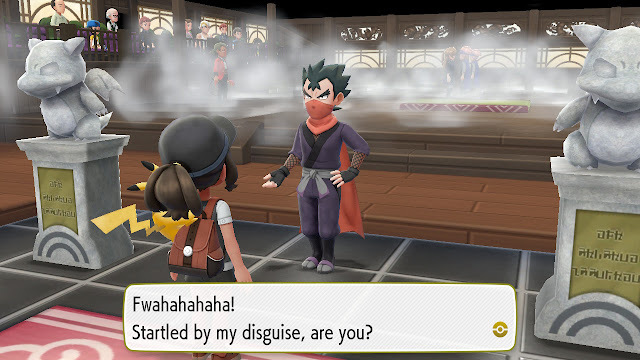 In future gens this guy becomes a member of the Elite Four, which definitely elevates him from your garden-variety gym leaders. 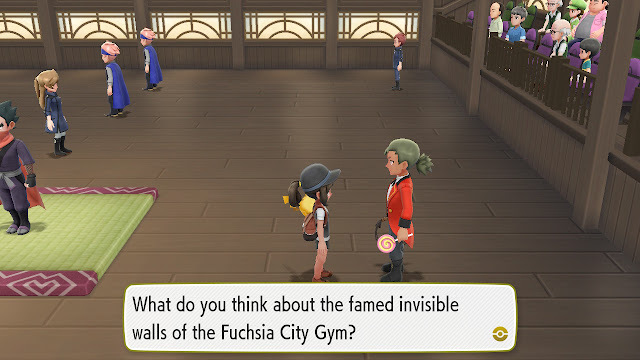 The gym itself is full of invisible walls so you have to feel your way around. It's tedious. Also, never trust someone who has a whip in one hand and a lollipop in the other. There is no protection from the onslaught of Blastoise! 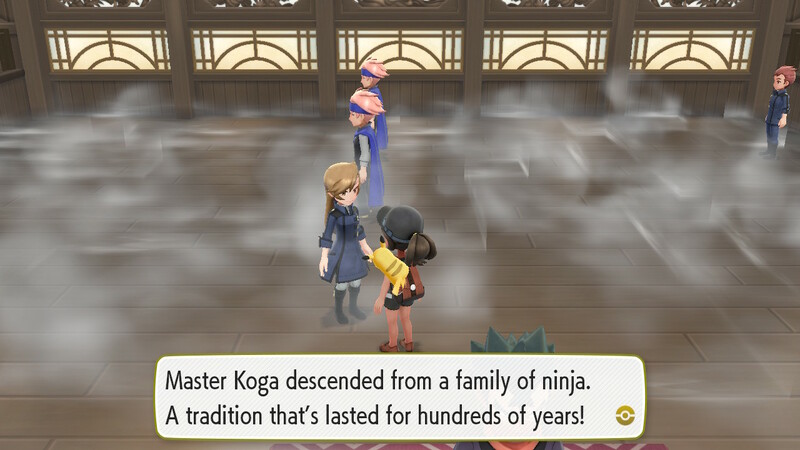 You can kinda see the invisible walls through the smoke that fills the room, which helps. Aside from ghost Pokémon, there are a lot of poison-types to fight here. 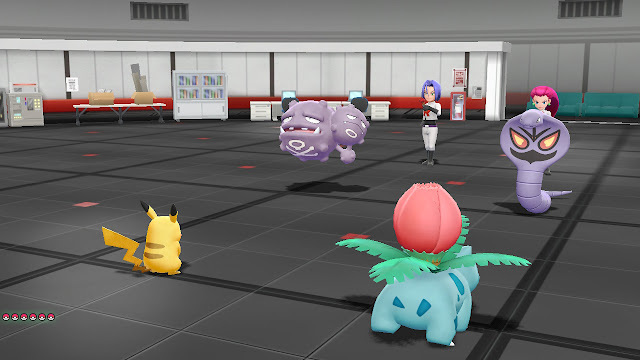 It also has more enemy trainers than any other gym up to this point. Koga can create illusionary versions of himself, though this doesn't figure into the fight with him. Interesting to note that this gym is full of spectators. Well, "full". The attendance isn't what it used to be. Koga unleashes several normal and poison-types, including Muk, Wheezing, Golbat, and Venomoth. It's a fairly easy fight, however, because none of them are as strong as Giovanni's powerhouses earlier. Not much to write home about with this fight, and we're moving along quickly. Victory gets you the TM for Toxic, which is one of THE most important offensive abilities in the game. 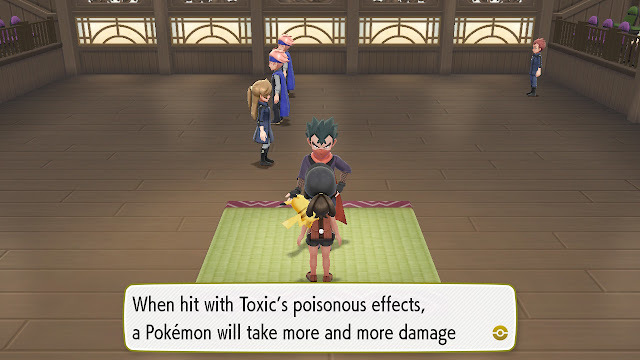 Unlike regular poison status effects, this one increases in damage each round. That rising damage makes it a very effective damage-dealer, and the best move to use on foes that you have to turtle-up against. 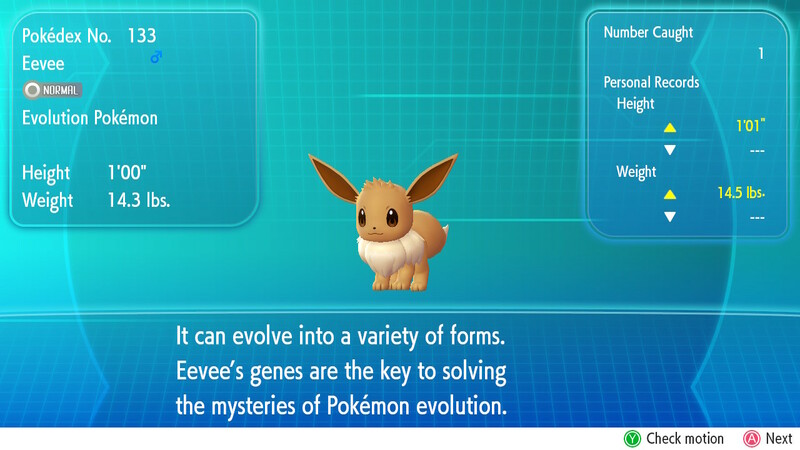 In essence, it lets you "punch above your weight" against stronger Pokémon. As expected, the Pokémon games definitely take inspiration from this. Next time on Pokémon: I take on Sabrina, the babe of Kanto. 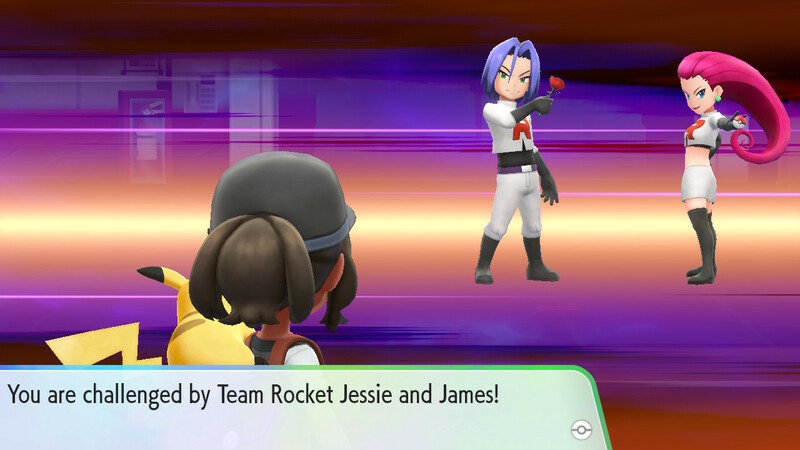 Jessie and James are the most logical "yet another fight" ever, at least. 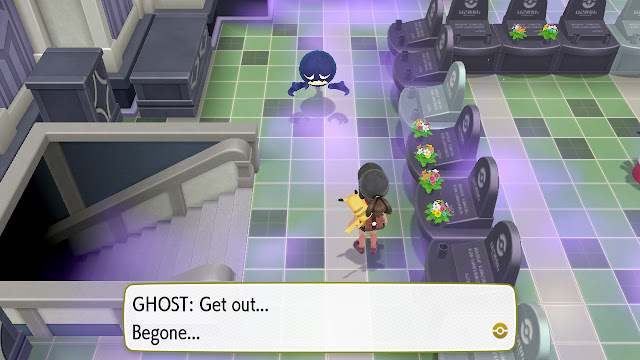 All of the ghosts in this game (aside from Alolan forms) are also poison-type, which was a pretty big oversight but also why they're in this gym. Hi! 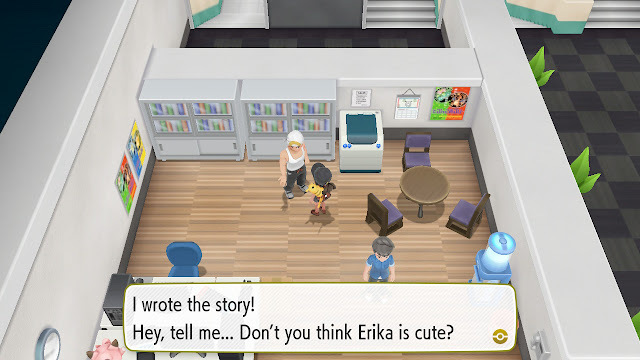 I'm glad you're still writing! 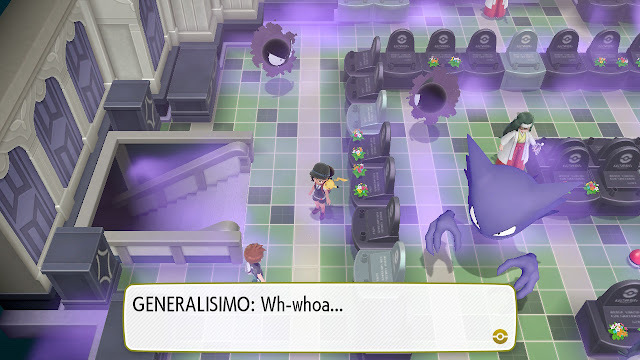 congratulations on writing "Torre de los muertos" properly! are you interested in Mexican culture? 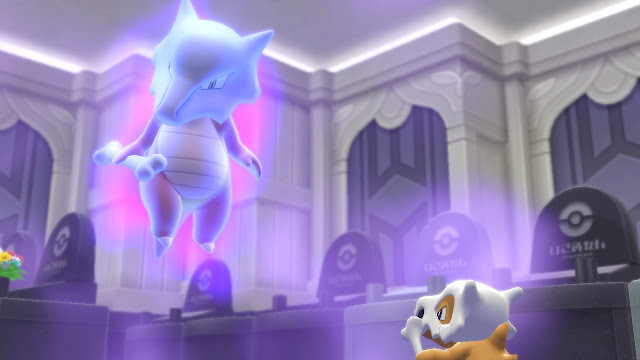 I'd love if gamefreak added some mexican-themed pokemon like rattlesnakes, jaguars, iguanas or eagles, I really like seviper as it looks like a rattlesnake made of obsidian and gold.